Long gone are the days when you had to dig deep inside your email browsers and long conversation threads to find that one techpack version you sent out on a particular day. Often designers and factories maintain folders on their computers to save all the versions of a style techpack shared between them. This helps to trace back the history of any design changes made by either to evaluate it's developments, or even to serve as cross-reference for any misunderstandings. From your home dashboard, click inside the style techpack you want to view all the versions of. At the top of your Techpack PDF preview all the previous shared history of this particular style will be displayed. All versions will be categorized by the time and the emails it was shared with. Plus you can also view those previous versions by clicking PDF next to them. This is an amazing time saving-tool. 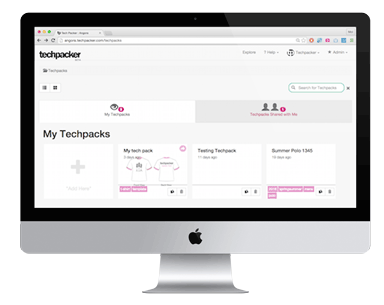 All your techpacks and their versions are now well organized and you can access them anytime, anywhere!